While we will still see conference championships this upcoming weekend, along with bowls and the Playoff, the 2018 college football regular season has come to an inevitable close. Its hard to believe considering it feels like just days ago the season kicked off, but after thirteen weeks fall Saturdays are officially done. With that in mind, I took some time to break down who I think should win the sport's officials awards, along with some unofficial ones. Without further ado, here are my picks for who should take home the college football's most important hardware. While it may seem tiring to the average college football fan seeing Alabama rack up wins, SEC Titles and eventually, National Titles we also have to respect what they've done. Nick Saban has crafted one of the most impressive and consistent dynasties in sports history, and he isn't done just yet. In fact, there is the argument to be made this could be his best Tide team yet. The defense is as suffocating as ever, but the offense has been historical, with a deep stable of stud running backs and the Heisman frontrunner at quarterback. The route to yet another National Title won't be breezy with Clemson and Notre Dame offering plenty of resistance, but picking anyone but 'Bama at this point seems just foolish to me. 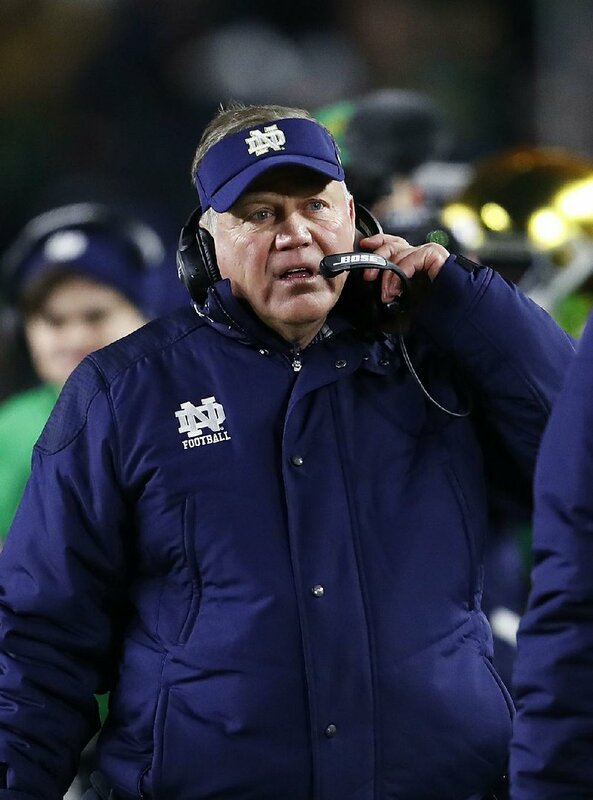 Brian Kelly's tenure in South Bend has been streaky and uneven at times, but there is no denying the superb job Kelly has done in 2018 with the Fighting Irish. Kelly had to deal with the loss of his rising defensive coordinator Mike Elko, who took a big pay increase this off-season at Texas A&M, and a number of key losses on the offensive side of the ball. Despite this, Notre Dame has put together a perfect 12-0 record that has included impressive victories over Michigan, Stanford and Syracuse. One of the main reasons for their success was the mid-season switch at QB, as Kelly opted to turn to Ian Book instead of veteran Brandon Wimbush. It was a bold move considering Wimbush was more proven, but it has worked wonders for this ND offense, and a big reason why Kelly takes home Coach of the Year honors. How did Oklahoma State respond to the losses of Mason Rudolph, James Washington Jr. and a number of other playmakers this off-season? Simply by finding sophomore Tylan Wallace, who was little used in 2017, but has exploded onto the scene this fall. Wallace has caught 79 passes for 1,408 yards (with 11 touchdowns) and consistently made huge plays for the Cowboys. That included huge performances against Texas in a win (222 receiving yards) and rival Oklahoma (220) that should help lock down this award. The impressive thing about Wallace is that he could be even better in the near future, considering this was only his second season in the collegiate ranks. This has been an extremely disappointing 2018 for Wisconsin, who has slipped to a 7-5 record one season after coming within inches of the Playoff, but that has not been the case for Jonathan Taylor. The sophomore has had a wonderful encore to a breakout freshman campaign, rushing for 1,989 yards and 15 touchdowns. Much like Wallace, Taylor has been crucial in a number of the Badgers' victories. This includes posting 253 yards against New Mexico, 221 against Nebraska and 208 against Rutgers, where he was one time committed. It hasn't been a banner year for running backs, but Taylor has done enough to certainly still earn some hardware. There was some question whether Tua Tagovailoa would live to the preseason hype we was receiving this off-season following a magical comeback win against Georgia in last year's National Championship. He has answered those questions and then some, throwing for 3,189 yards and 36 touchdowns with just two interceptions. Those stats aren't quite as gaudy as some past O'Brien Award winners, but considering Tagovailoa has sat a number of fourth quarters with Alabama winning in blow outs, its still impressive. A former five-star recruit who originally signed at Texas A&M, big things were expected of Kyler Murray taking over Baker Mayfield's reigns in Norman. Murray certainly has not disappointed, with 3,674 yards through the air and 48 total touchdowns (37 passing, 11 rushing), while proving to be one of the most explosive players we've seen at the position in years. Murray's impact has certainly been felt at Oklahoma, as he has helped them overcome an atrocious defense to go 11-1 and once more return to the Big 12 Championship. Amazingly, this will be Murray's final year of college football, as he recently reaffirmed his plans to join the Oakland Athletics organization after going in the first-round of the MLB Draft this past summer. There were some folks who openly questioned why former four-star recruit Rondale Moore chose to stay close to home and play at Purdue, who for years has been a mediocre program in the Big Ten. With his true freshman season now in the books, its hard to argue Moore made the wrong decision. The speedy wide out burst onto the scene with two touchdowns in the first week of the season, and finished with 1,164 receiving yards and 13 total scores. That included a magical showing in a primetime upset of Ohio State, which led many to start mentioning Moore in the Heisman conversation. It isn't a secret Alabama produces star defenders year in year out, and this latest defense isn't short of future NFL Draft selections. However, the clear-cut best player on this defense has to be sophomore Quinnen Williams, who had a dominant 2018. On the season, Williams finished with 58 tackles, 16 tackles for loss and seven sacks. He looked absolutely unblockable in a number of games this year, including embarrassing LSU earlier in the year. There is zero doubt Williams is going to be a high NFL Draft pick this upcoming spring, and he has the potential to get even better. As I mentioned earlier, Tua has put up incredibly impressive numbers all season long, and there shouldn't be much doubt he will be hoisting the Heisman Trophy in New York in a few weeks. Tagovailoa is undoubtedly the best player on college football's best team, and his dominance this year has seemed to be almost easy. He has consistently decimated great defenses, including a showing against LSU earlier in the season where he had a 44-yard TD run that certainly looked like a Heisman moment.